As always, the views expressed in this post are their own and may not reflect the views of their employers. 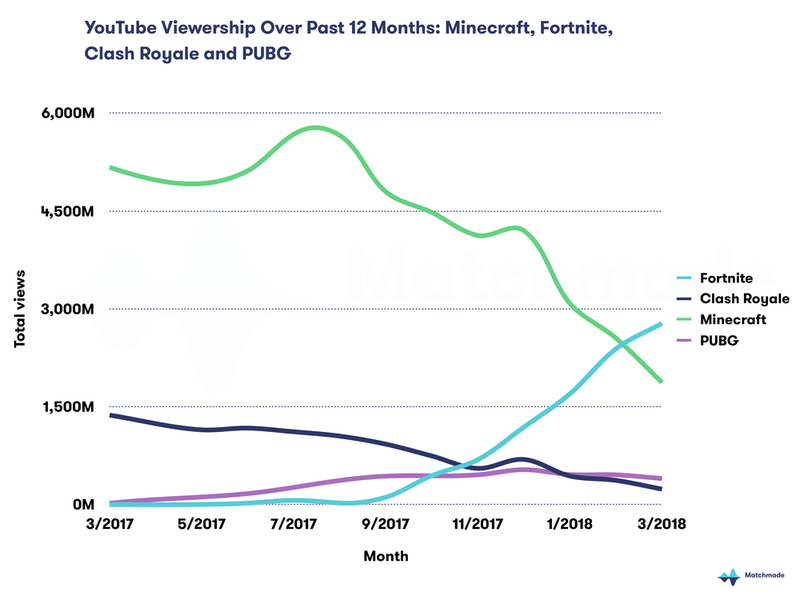 Fortnite is by far the most viewed and streamed game on YouTube. However, while the Battle Royale genre continues to heat up, I’d like to focus on a specific topic: the Battle Pass system as the monetization driver. Fortnite, for all of its smart decisions and flaws, made one key choice months after its launch: it wasn’t going to monetize based on loot boxes, instead, it was going to monetize off of its Battle Pass system. While Fortune does have loot boxes, they are not the drivers of monetisation, unlike the case with the competing titles. It’s not as if Epic hadn’t thought of making it a loot box driven economy -- Fortnite’s own “Save the World” mode is a loot box driven economy which you buy llama-themed pinatas that contain random gameplay-impacting items. Yet for their Battle Royale system, they chose to go against this. Regardless of what you think of the choice -- Fortnite’s revenue shows they’ve done something right. Fortnite has been steady as the top grossing game on mobile for weeks now, demolishing traditional mobile free-to-play titles, and outpacing all other battle royale style games on mobile in both downloads and revenue. The fact that the game was invite-only for the first weeks or so makes the feat even more impressive. However, these results beg a question: is the revenue coming simply because of the user base size (DAU), or does the Battle Pass system actually drive higher revenue-per-user than a loot box system? In terms of KPIs, we'd be comparing ARPDAU or ideally, LTV. While no one but Epic can peek behind the curtain and see what their metrics are, we will speculate today! Much like in MOBAs, Fortnite’s progression and monetization only come from cosmetics. Fornite is a "free-to-win" model: they do not sell anything that could impact the balance of the battle royale gameplay. All guns, armor, ammo is scavenged in the battle royale gameplay, but a player can choose what cosmetics they want to bring into a match. Outfits is one of the main cosmetic elements desired by players. Since progress isn’t made through traditional stats and level up, the only way to show off your progress is through cosmetics. It’s not pay-to-progress, it’s pay-to-look-cool. Until Fortnite, cosmetics-only based mobile games have not been able to achieve strong overall revenue, at least in Western markets. 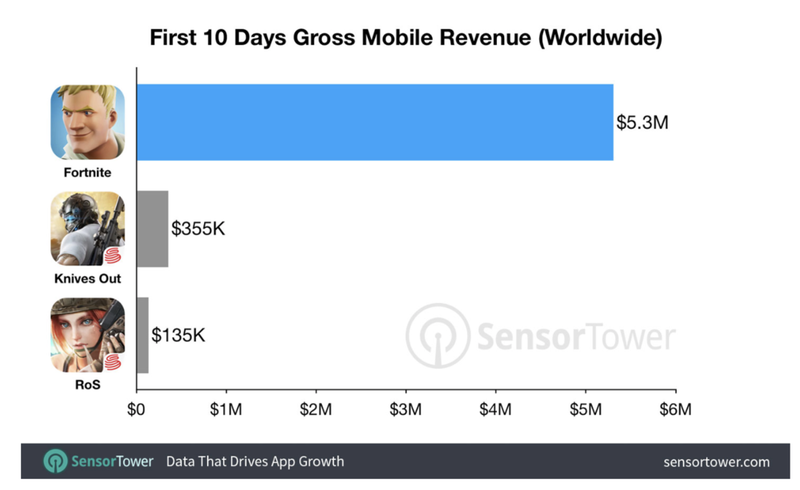 Although the large revenue growth certainly derives strongly from a massive number of installs, the amount of revenue and the #1 top grossing status cannot be explained without a level of monetization heretofore unseen by cosmetics in Western markets on mobile. Fortnite features a full cosmetics driven economy. With the cosmetic driven economy, rather than dropping new cosmetic gear through gacha/loot boxes (like Overwatch, Destiny, etc.) 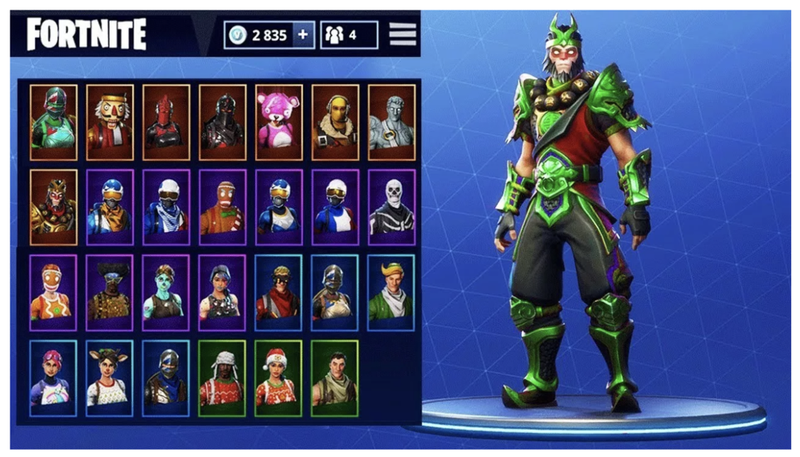 cosmetics are either purchased with V-bucks (premium currency) or earned through the battle Pass. Interestingly, directly purchasing cosmetics through the shop has limited access. Each day there is a limited selection of items to purchase, so while loot boxes aren’t included in the economy, there is a limited set of items that are available at any time. 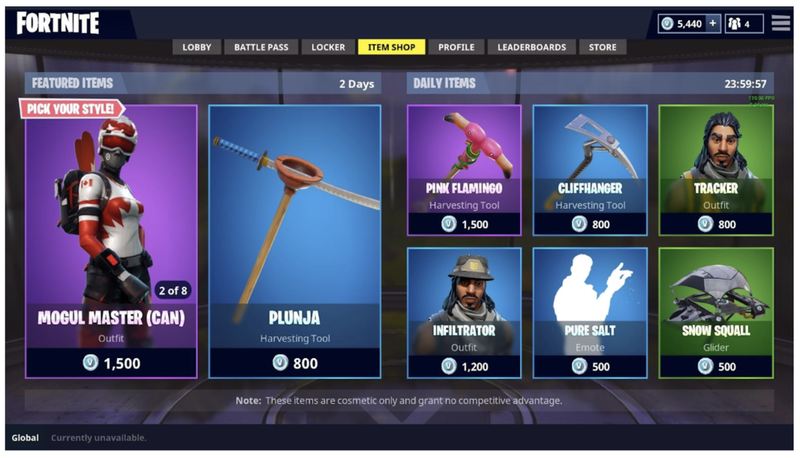 Great for driving players to check the shop out daily, and giving additional pressure to purchase items while they are available. Besides being able to purchase cosmetics with premium currency, players can also play and earn cosmetics and consumable boosts by completing their Battle Pass. The Battle Pass is a set of rewards which can be unlocked by completing challenges. Completing challenges rewards the player with XP, which increases your tier, which unlocks subsequent rewards. The challenges themselves range in difficulty but give a baseline of progress for the Battle Royale style game. When playing a Battle Royale game, especially if you’re not skilled, most games will end up with getting shot and losing all your progress. Also in many battle royale games there can be times when you’re waiting around for other players to arrive. These challenges give players additional goals to think about while playing, and can make even a losing round feel like progress. Challenges give players additional goals to think about while playing, and can make even a losing round feel like progress. The monetization comes in with the free vs premium tracks, much like the VIP system in Wargaming’s World of Tanks (read the full deconstruction of World of Tanks). Free players get far fewer rewards than the premium tier. Creating a very clear conversion effort. Look at all the stuff you “earned” but didn’t receive! The amount of content given out for the premium tier is compelling -- its generous in terms of the payoff and pays back your effort quickly. This feels very similar to Annuities or “Subscription Diamonds” in mobile games. A small price that pays out far more than it costs - but only if you engage in the game. When purchased, Battle Pass allows player to earn significantly more rewards during a seasons than free players. The Battle Pass is limited to a season, which is what makes it so compelling. 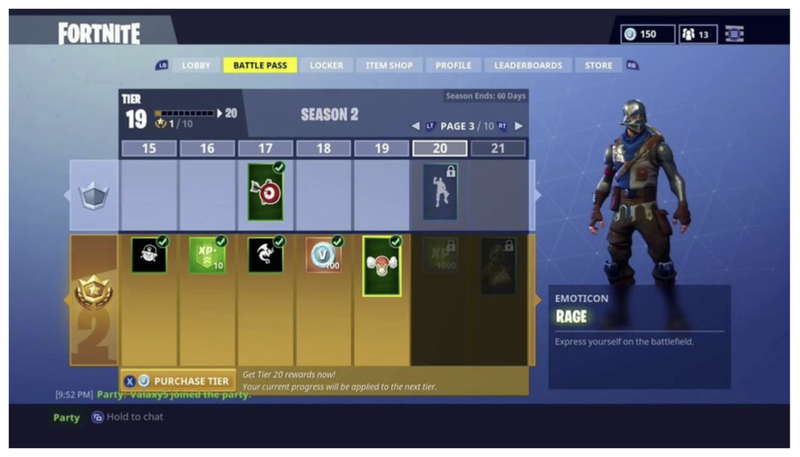 Each season has a matching Battle Pass, which comes with its own set of cosmetic content and rewards. If you don’t complete the battle pass in time -- you don’t get the content. Some content may come in and out of the store on a daily basis -- but then it’s usually for high costs of premium currency. There’s a big “Fear of Missing Out” feeling with this system. Monetization is also not just limited to the seasonal purchase of the Battle Pass. Players can also pay directly to skip ahead in tiers. If this was in any other game, most free-to-play designers would shoot this down. It’s usually a far better idea to monetize players on the gameplay itself and not allow players to directly pay to skip. It would feel very pay-to-win if you could directly pay to reach the top arena in Clash Royale, or pay to skip a set of levels in Candy Crush. However, since Fortnite can’t really monetize on the core gameplay, and this is really just paying to reach cosmetic content (your battle pass tier isn’t really a metric player compare as a sign of skill) -- player’s don’t seem to mind, and their revenue isn’t impacted. Player’s have a way to pay-for-progress to the cosmetic items they want. Want a head start on the season so you can show off the cosmetic items before your friends get there? Pay to skip ahead! A week’s challenges or season coming to a close and you don’t have time to get all the remaining challenges? Pay to skip ahead! For this reason, the spend depth and potential of the battle pass system shouldn’t be seen as limited to just the monthly purchase price. When a player has locked into the battle pass, they are more likely to be highly engaged that season to unlock the content and to convert on skipping ahead to get all that content they unlocked. Battle Pass can be best described as a system first and foremost for retention and player experience. Comparing Battle Pass to Player Unknown Battlegrounds (PUBG), it gives players real goals, a direct sense of progress, and a clear path to the cosmetics that they want. PUBG instead uses a loot box system to gate all of their cosmetic content. Players play a match, get as many “Battle Points” (BP) as possible, to eventually open up a loot box. PUBG's loot crate system is less than perfect compared to industry standards. For example, it doesn't allow 'dusting' unwanted items to acquire desired ones. These loot boxes can sometimes be locked with a key that needs to be bought with real money, which feels pretty much like a blatant rip-off. Like most gacha systems, as a player, this means the path to desired content is completely luck-driven. You can’t even save your BPs or a dust-like currency (example: Credits in Overwatch, or Dust in Hearthstone) to eventually get the item that you want. You just need to get lucky. From a player’s perspective, Battle Pass simply feels fair compared to the competitors gacha systems. It’s a compelling conversion item + retention driver. The amount of content for the price and the clear visual of seeing content that you “earned” but can’t access is a compelling driver to both monetize and engage in the game. 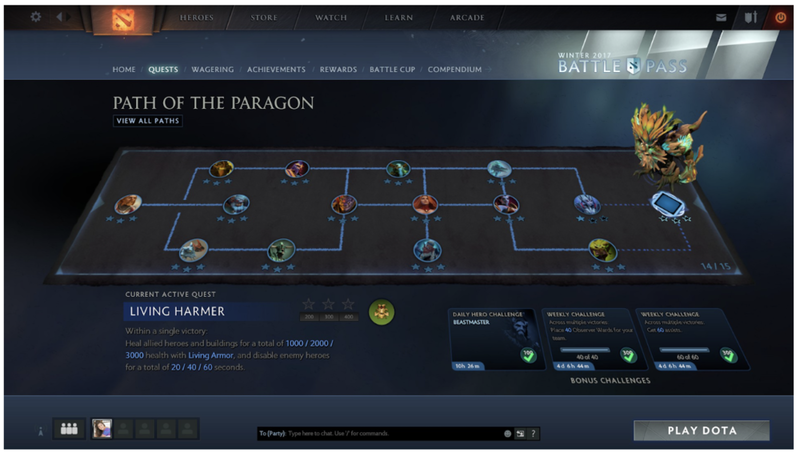 But it's not as if this Battle Pass system came from nowhere, it’s obviously inspired by the playbook of Valve’s DOTA2. Their compendium battle pass has been a staple of that game since 2013. Looking at Valve’s evolution of the compendium, you can see potentially how this system will evolve in Fortnite. Started in 2013 as an incentive for players to donate & get interested in the e-sports scene of DOTA2, the compendium was essentially an interactive guide to an upcoming tournament. Similar to a guidebook you’d get at a sporting event: it told you about the players, tracked the stats, and got you interested in the game itself. Valve doubled down on this by making it digital, interactive, and gave a portion of the money raised by the compendium as part of the prize pool. Players had a way of supporting the esports scene for their favorite game. This has since evolved quite a bit. What started as just a compendium turned into a battle pass. They eventually added goals for players to accomplish in PvP that would increase their level for that season, and unlock cosmetic rewards (just like Fortnite's today). However, DOTA2 has gone far deeper, with a number of recent additions that significantly increase the depth of the system. Multiple Paths give players choices as they progress in the battle pass, giving far more goals in parallel for advanced players. Also, give further reason to reach higher levels in the battle pass (some paths only unlock when you’ve reached a high enough level). Treasures/Loot Boxes as rewards rather than direct cosmetics. This gives players a mix of direct rewards and a chase to get the random rewards that they want. 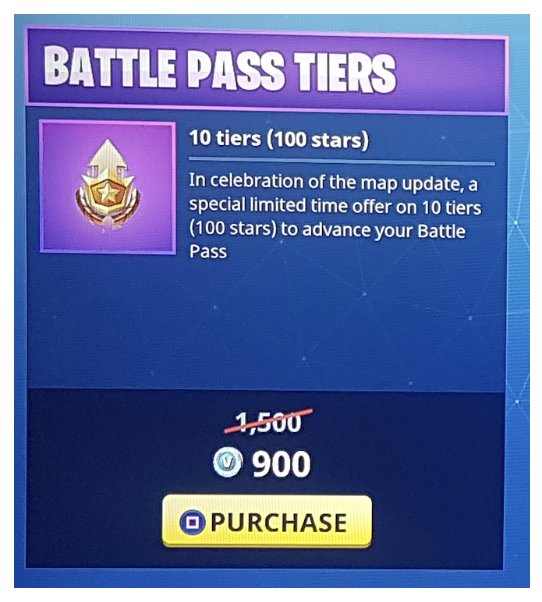 So while Fortnite’s Battle Pass system may just be in its “early access” phase right now with a basic feature set, it's clear that Epic is taking inspiration from Valve’s similar Battle Pass system. This evolution shows that the current implementation is not just limited to 100 tiers of content, but could be a far longer lasting and complex chase which could drive even higher retention and monetization. 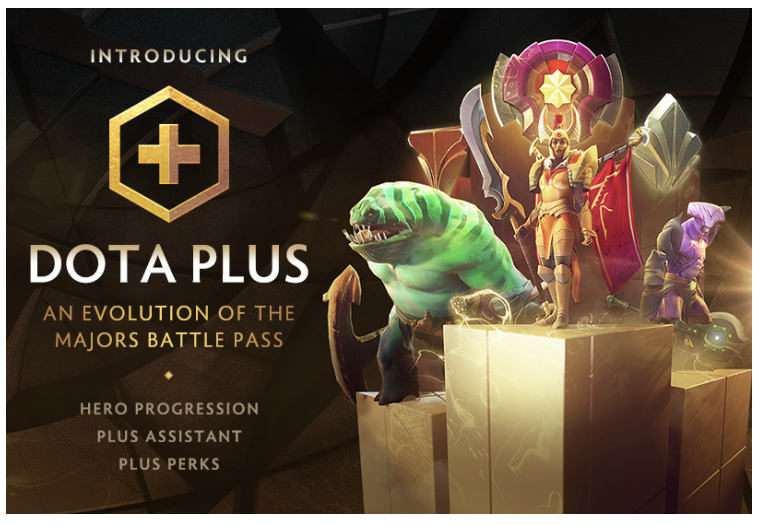 This system clearly has been successful for DOTA2, since recently they’ve started to shift the system to a full-on subscription style service called “DOTA Plus”. Little details are known at this point, but it looks to be replacing the Battle Pass with an ongoing subscription that gives even further systems and progression. But comparing the Battle Pass system to a pure-gacha system, is Fortnite (and potentially DOTA2) leaving money on the table? While it’s obvious that its a play for stronger retention and higher conversion, is the lower spend depth hurting them? Is the tradeoff of giving away all this cosmetic content for higher conversion really the smartest business decision? Battle Pass vs. Cosmetics: How does Battle Pass monetization compare to other forms of cosmetics based F2P, mobile monetization? Battle Pass Overall: How does Battle Pass monetization compare to F2P, mobile monetization overall (including pay-to-progress models)? We can get a rough sense for both of these questions by doing some high-level comparison. In particular, we can a) compare monetization of the various “fair-to-play”, cosmetics driven Battle Royale games and then b) compare monetization with “pay-to-progress” game monetization schemed games. Let’s now address the first monetization question we posed above: How does Battle Pass monetization compare to other forms of cosmetics based F2P, mobile monetization? The other key driver for monetization for Knives Out is it’s audience. Japan *generally* monetizes much more strongly than other countries, often 2x+ that of US. Hence, the large concentration of Japanese users in Knives Out primarily drives the monetization gap between Knives Out and Rules of Survival. So what happens to monetization if we were to exclude Japan? Wow, what a difference a country makes! Without Japan, Knives Out actually becomes the worst performing game in term of monetization. Somehow Fortnite per user monetization actually does better without Japan. Let’s now address the second question we posed regarding Battle Pass monetization earlier: How does Battle Pass monetization compare to F2P, mobile monetization overall (including pay-to-progress models)? From the Lifetime ARPI chart, it would seem to indicate that more traditional F2P monetization mechanics such as gacha or PVP speed-ups are much more effective on a per-user, unitary level than cosmetics based monetization. Months to LTV: How much further can a cosmetics driven monetization last over time? Downloads vs. ARPI: Although ARPI for “free-to-win” games may not be as high as other, more traditional F2P monetization mechanics, these games should generate higher install volumes based on the friendlier monetization scheme. Let’s discuss both of these points in turn. So how long can gacha based games continue to increase ARPI until it hits LTV? Unfortunately, we only have 6 months of data on Rules of Survival and Knives Out and less than 2 full months for Fortnite. One way to estimate the ARPI growth is to just do a logarithmic trendline and extend out the timeframe to say 20 months. Based on the above ARPI growth continued for at least 15-20 months. Hence, the 20 month timeframe for our logarithmic trendline earlier. Traditional F2P designers would typically assume that cosmetics driven monetization should hit their LTV ceiling much sooner than a well-designed gacha game. However, for the sake of simplicity, and just to get a rough feel let’s assume that the fair-to-play game monetization will follow a similar trajectory. In fact, let’s just eyeball all of this pretty roughly to estimate LTV. On the face of it, Knives Out and Fortnite would have similar long-term LTV estimates based on our analysis above. However, when we factor in audience concentration, we can conclude that Fortnite has much stronger monetization design. This was clearly shown when we excluded Japan from our monetization data earlier. Although we’ve focused so far primarily on unitary economic measures like ARPI, at the end of the day, what matters most will be the amount of overall revenue (and profit) a game can generate. Hence, in addition to ARPI/LTV we must also look at product level economics by also looking at downloads and in turn overall revenue. As you can see from the chart below, while free-to-win based monetization has not performed as well on a per player basis, but overall revenue can be quite healthy even compared to top pay-to-progress types of games. Also note that we only have less than 2 months of data for Fortnite (so it’s not an apples-to apples-comparison), and it has been limited by a number of issues such as being iOS only and having high-end device requirements. Further, Clash Royale, unlike the other titles, leveraged one of the strongest IPs in mobile gaming and utilized massive user acquisition to help drive stronger install volume for their game. Battle Pass For the Win! So, what is our conclusion on the original monetization questions we posed with respect to Battle Pass? While pay-to-progress style economies will certainly drive higher per-player revenue, for games that monetize off cosmetics the battle pass is certainly showing impressive results. Battle Pass will likely become a dominant monetization system used with cosmetics based monetization in the future. Not only can it provide far better player experience, but by a rough calculation, it shows that it can drive higher LTV. Just keep in mind these calculations are rough - these are using estimates of revenue and downloads, we’re using trendlines based on a small set of data, and we’re looking at a game that didn’t start from scratch when launched on mobile. The legion of fans that came over from PC/Console area already highly engaged and used to its systems. We’ll need to see how this goes in the coming months! Yet by these rough calculations, we’re pretty excited. A player-friendly system that gives better goals and drives higher engagement shows the path to stronger revenues. All the while Valve’s DOTA2 shows that this is just the MVP of a battle pass system. Bringing in a hybrid of gacha design and a deeper battle pass will most likely be the future for cosmetic driven games.